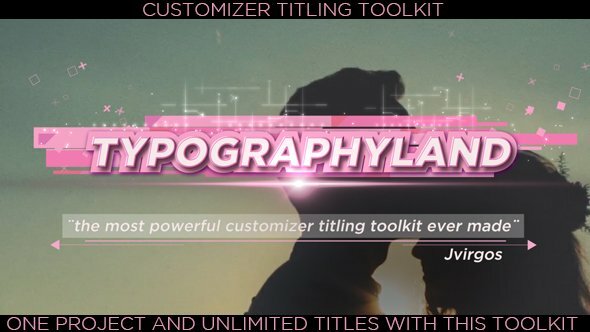 Typographyland is more than project it´s a powerful toolkit suite to generate infinite graphic titles with just a few clicks (and no plugins purchasing is needed ). Typographyland is the ultimate Titles Toolkit Generator Suite. And the most important: all of them can be combined with the powerful customizer tool to create infinite differents grapchis titles and also to adjust positions, size, width, colors, stroke , opacity, glow, blur and much more just by switching on-off or moving sliders or picking colors!!. Just click them and go! And even more! The suite comes with 37 fx titles and graphics boxes presets ready to use with different styles . Use them or modify them from there! That´s not all… The pack also include 10 fx in titles animations ready to use. New fx and elements will come with future updates. Stay tuned!! This is definetively a must-have tool in your library!